Salt Dough Handprint Ornament - The Easiest Way to Make Salt Dough! Just in time for Christmas – this is a really easy and fun craft for the kids. 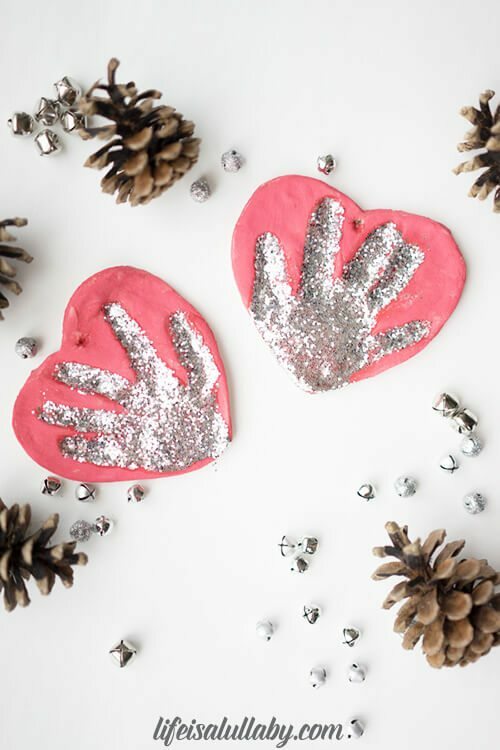 Learn how to make this pretty and glittery Salt Dough Handprint Ornament to place on your Christmas Tree! What I love most about these salt dough ornaments is that they’re made from all ingredients you have in your kitchen! And because of this it’s completely safe for the little ones to work with. With Christmas coming up, We love focusing our crafts on the holiday season. 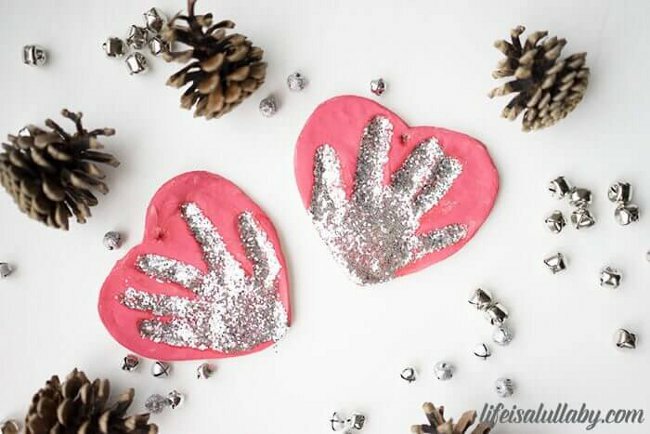 We have always seen Salt Dough Handprint Ornaments before and thought they were a really nice way to make a memory of your little one’s hand to cherish on the Christmas tree. You could easily make a new one every year and have a nice memento for the Christmas tree you can compare to each year! Simply add the year on the back of the salt dough ornament to keep track of the different years. Kids will love helping to make this salt dough recipe. Part of the fun is them being able to stamp their hand into the salt dough! This was one of the best parts. They will also have fun decorating the salt dough ornaments by painting it. 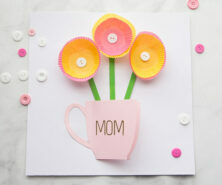 Of course if you want a really nice keepsake – you may want to make a few extras to paint one that is fully painted if you have a younger toddler. The sky is really the limit for decorating this Salt Dough Handprint Ornament. We decided to paint it red using acrylic red paint but you could choose green or even silver or gold. Then you can decide to leave the handprint portion of the salt dough ornament either natural, or you could paint this a different colour or use glue and add glitter to it like we did. There’s so many different ways to decorate this ornament! Another idea is you could apply some glitter stickers around the outside of the handprint also. Once you are done, don’t forget to seal with either mod podge or a clear glaze spray. We like this spray for a durable finish. Adults should do the spraying and always follow directions of the product chosen. Sealing the final ornaments will help stop them from cracking in a few years. Finally, just a friendly reminder to keep these out of reach of pets (they can be toxic to dogs especially) and small children that would want to put them in their mouths. Note: If you find that the ornaments are still a bit doughy, put them back in for another hour or so. The thickness of the dough will determine how long you have to bake them for. You can also raise the temperature up to 325 degrees F but do this gradually as they may start to puff up. We prefer to bake them at 250 degrees Fahrenheit for longer and let them air dry for a few days. 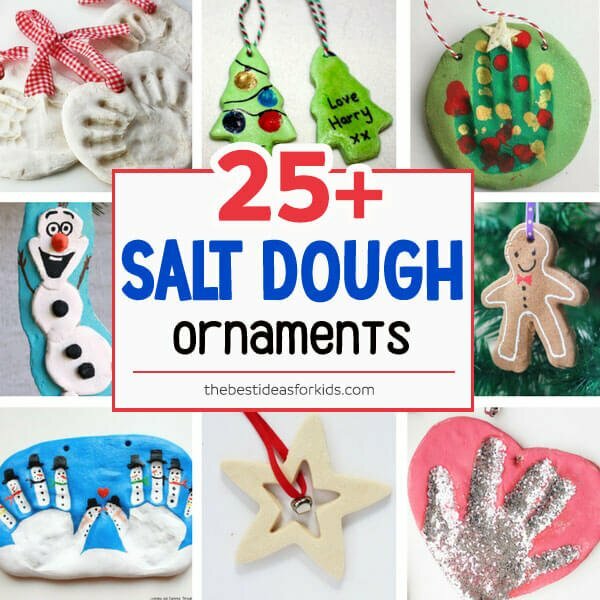 How to Make a Salt Dough Handprint Ornament – Easy Salt Dough Recipe! Combine all of your ingredients and knead for 10 minutes. If your dough is too dry add a little bit more water in and continue to knead. 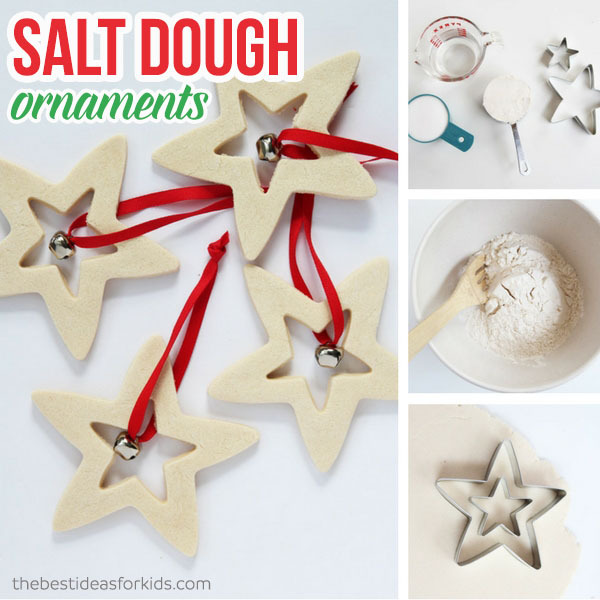 Roll out the dough to a thickness that you'd like your salt dough ornament to be. Using a large cookie cutter, cut out different shapes for your salt dough ornament. Have your child place their hand into the salt dough ornament. If the dough is too hard to get an imprint it may be too dry and you can continue to knead by adding in a little bit more water. Bake for 1-2 hours. If your ornaments are still doughy, put back in for another hour. (It will depend on your thickness how long you need to bake for. The thinner ornaments will take less time but thicker may take more). If you encounter too much puffing, roll out thinner ornaments and this will help reduce the puffing. If the ornament is still a bit doughy, bake for longer or let sit out a few days to harden before decorating. The thickness of the dough will determine how long you have to bake them for. You can also raise the temperature up to 325 degrees Fahrenheit but do this gradually as they may start to puff up. We prefer to bake them at 250 degrees Fahreneheit for longer and let them air dry for a few days. 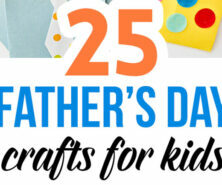 Once cool, you can decorate by painting with acrylic or kids paint. To make the hand glittery, fill the handprint with glue then sprinkle glitter on top of the glue, shake off the excess and let it dry. Spray with a clear glaze finish or finish with mod podge. There you go – that’s all it takes to make your very own Salt Dough Handprint Ornament. Pretty easy, right? Looking for more Christmas fun activities and crafts for the kids? 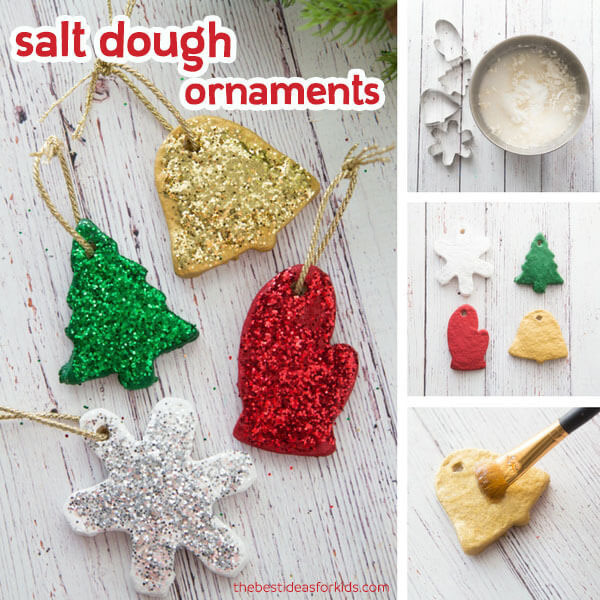 These salt dough glitter ornaments are so fun to make – and you can make these for any season or holiday too! These star salt dough christmas decorations are the perfect gift idea for kids to make for Christmas too! Hi, I would like to try this with my preschool students. Can they be air dried? Yes but if they don’t fully dry out just send home instructions for additional baking time. We haven’t tested that but read the instructions on the label of the product and it should say whether it will work or not. How many handprint ornaments does the recipe make? At least 15 but depending on the size you could definitely get more. Also roll them out thinner and you’ll get more and they won’t take as long to dry.